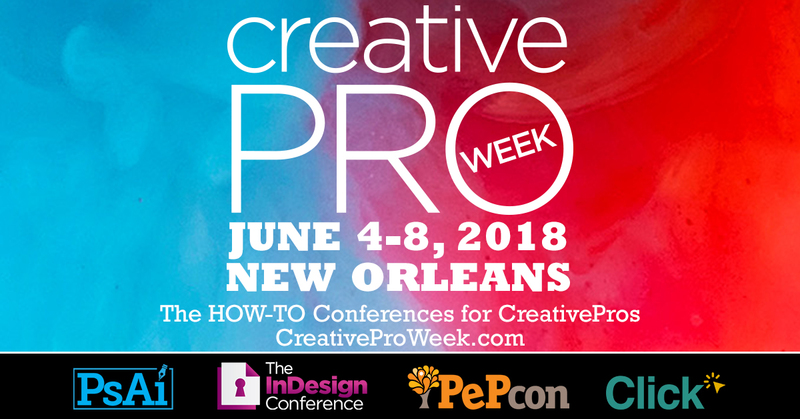 From the CreativePro Week website: CreativePro Week features top experts and trainers in the field of layout, image editing, illustration, retouching, design, production, and publishing. We produce the world’s most effective “how-to” conferences for creative professionals, and our speakers are the heart and soul of our events. Our attendees are designers, illustrators, production artists, photographers, artists, and publishers interested in keeping up with best practices and the newest innovations in publishing workflows. If you want to master the tools of the design and publishing trade and learn new, advanced skills that will keep you at the forefront of our field, then CreativePro Week is your home. Check out CreativeProWeek.com for all the details about my sessions and all the wonderful sessions being presented at this super week of information!